The main purpose of the game is to checkmate the opponent's king. So it is clear that the kings are the main pieces on the board. 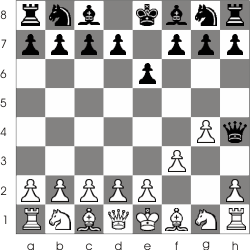 The attack on other pieces and their capture are meant to remove the king's defense. For example in the following game the black king is checked. It can be made safe in all 3 ways I've mentioned earlier. 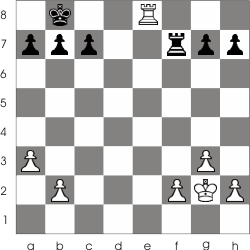 First, by capturing the white bishop at f5 with the black knight from e7 : 1... Ne7:f5. 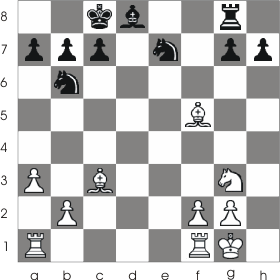 The king can be made safe also by moving the knight form b6 in front of the bishop : 1... Nb6-d7. 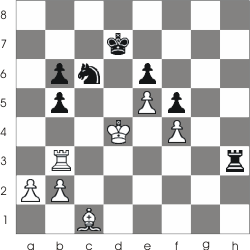 Last but not least the king can be made safe by simply moving it to b8 1... Kc8-b8. I said earlier that when your king is checked you can defend it in 3 ways. But what if you can't defend it! Then what? Very simple. The king is in checkmate and you just lost the game. Life is hard huh? But don't be sad there are other games. And there is always chessguru.net where you can learn how to avoid that nasty checkmate and how to checkmate your opponent. A king can be checkmated any time during a game, sometimes even at the beginning(because of some mistakes of the player).When the checkmate comes at the middle phase the game it usually comes after some ingenious tricks, or again because of some mistake the opponent does. 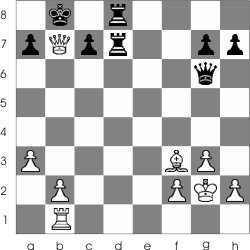 I mentioned before that the main purpose of the game is to checkmate the opponent's king. Some beginners usually take this statement to literally. That is, they start the game by solely focusing on that task and ignoring other important aspects. We will talk later on about the best way to start and play the game. Now let's just keep on the subject. Although a game is won when the player checkmates the opponent king most games don't last until this point. When a player realize his opponent has too much of an advantage and that he has no way to gain any advantage he usually quits the game. Take a look at the following examples to see possible positions of checkmate. In the previous tutorial we talked a little about castling; let's get more into detail!